Dr. Sam Noordhoff, and his wife Lucy ending their terms. Dr. and Mrs. Noordhoff first came to Taiwan as medical missionaries in 1960. They were sent by the Reformed Church in America （ R.C.A. 美國歸正教會）. The Noordhoff’s have devoted much of their efforts to improving the lives of people born with cleft palates and other facial disfigurements. 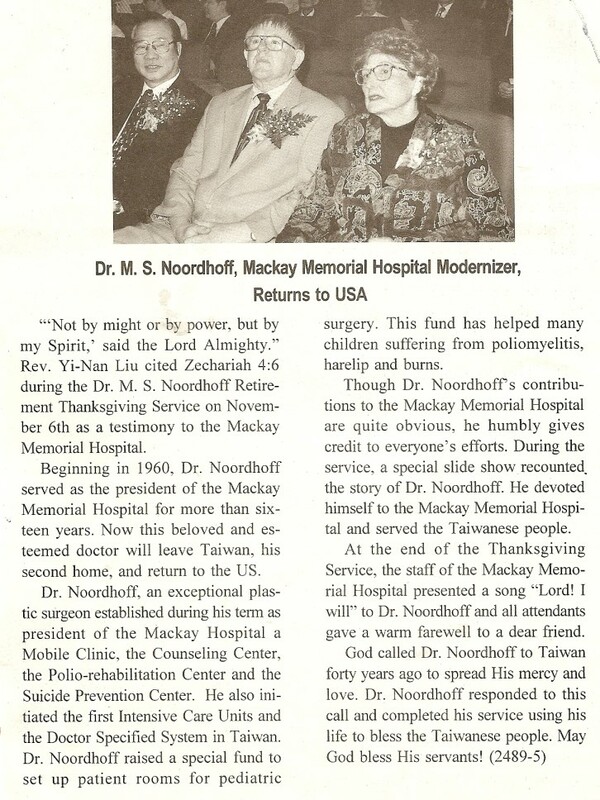 Dr. Noordhoff, an internationally recognized plastic surgeon, began his work at Mackay Memorial Hospital （馬偕紀念醫院） in Taipei. After 16 years, in which he served as hospital superintendent for Mackay, he moved to Chang Gung Hospital （長庚醫院） where he became chairman of the Department of Plastic Surgery He and his wife helped establish the Noordhoff Foundation, which aids patients in need of facial plastic surgery.